The Honourable (retired) Justice F.B. William Kelly passed away on May 13, 2016, surrounded by his family. He was 79 years of age. Justice Kelly retired from the Nova Scotia Supreme Court in September of 2009 after 24 years on the Bench. He was a Judge of the Nova Scotia Family Court in 1984 for Sydney. In 1985 he was appointed a Judge of the Nova Scotia Supreme Court, Trial Division and when that court merged with the County Court in 1993, as a member of the Nova Scotia Supreme Court. Justice Kelly was born and raised in Charlottetown, P.E.I. He attended St. Dunstan’s University (UPEI) where he obtained a B.A., and in 1967 graduated with an LL.B. from Dalhousie Law School in Halifax. 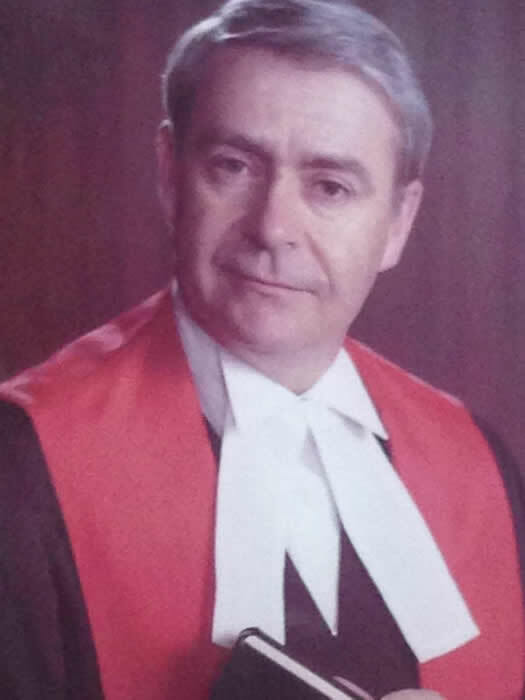 He was admitted to the Bar of Nova Scotia in 1968, served on the Nova Scotia Bar Society Council for several terms and was appointed Queen’s Counsel in 1983. At the beginning of his career, Justice Kelly practiced civil litigation and criminal law in Port Hawkesbury. He also served as a labour arbitrator and Small Claims Court adjudicator. During his time on the Bench, Justice Kelly authored and presented papers principally on judicial independence, the relationship between the Press and the Judiciary, and the role of victims in the Courts. Described by his colleagues as a true “gentleman of the law,” Justice Kelly served as a member on a number of Supreme Court and Bar/Bench committees. Among his many roles, he was Co-Chair of the Judicial Development Committee established by the Chief Justices and Chief Judges of the province, a committee which developed a pilot program to improve judicial performance and education. The program was the first of its kind in Canada involving judicial assessment. Justice Kelly is survived by his loving wife, Helena Dowling-Kelly, children, Lawrence, Heidi and Shannon, and grandchildren, Sarah, Liam, Jeremy, Kathleen, Conlon and Finn. He also leaves behind his dear siblings, Loretta Butler and Jimmy Kelly, and many nieces and nephews. Read the entire obituary here >>.